Heat oven to 325°F. Place ham, fat side up, on rack in shallow roasting pan. Insert meat thermometer so tip is in thickest part of ham and does not touch bone or rest in fat. Cover loosely and bake 1 hour 15 minutes to 2 hours 15 minutes or until thermometer reads 135°F (13 to 17 minutes per pound). About 20 minutes before ham is done, remove from oven. Pour drippings from pan. Remove any skin from ham. Mix brown sugar, vinegar and mustard; pat or brush on ham. Bake uncovered 20 minutes longer. Cover ham loosely and let stand about 10 minutes or until thermometer reads 140°F. Garnish with orange slices and cherries. While the ham stands for 10 minutes, the temperature will continue to rise about 5°. You'll notice that the ham will be easier to carve as the juices set up. 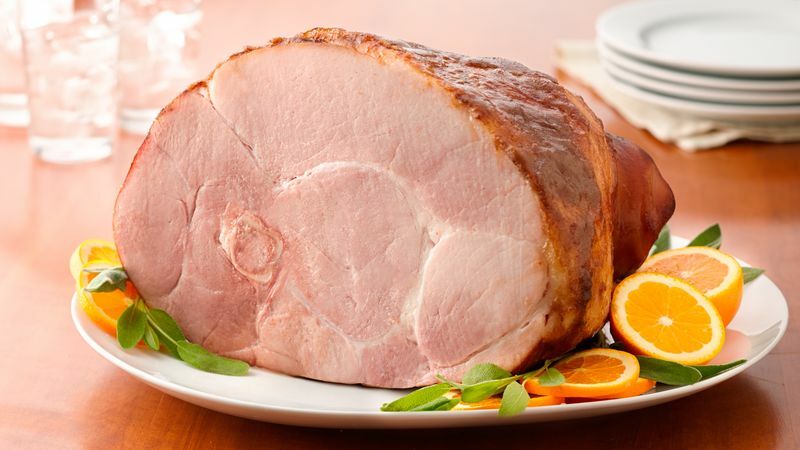 Although this ham is delicious on its own, you may want to serve it with honey mustard, horseradish sauce, applesauce or a fruit chutney.